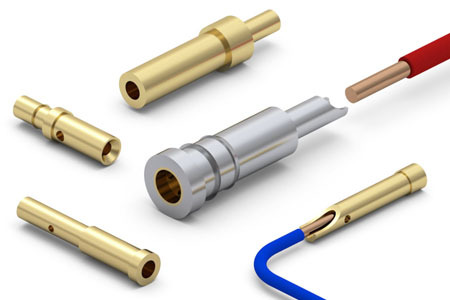 Mill-Max has expanded its selection of wire termination products with the addition of new wire crimp and solder cup receptacles. The three new wire crimp receptacles can accommodate wires from 22-26 AWG and accept mating pins in the popular .025" (,63 mm) - .040" (1,02 mm) range. The two solder cup receptacle additions provide solutions for solder terminations of disparate uses. The 9177 is ideal for high current, rugged applications handling currents in the 15 amp range while the 4485 can be used on pin-to-pin spacing down to 2 mm. Three of the five parts have inspection holes to accommodate wire viewing and to promote plating coverage inside the wire termination holes. Please see Tables 1 & 2 below for details. The receptacles are a two piece construction with a precision-machined outer shell and stamped beryllium copper internal contact. Like all Mill-Max receptacles, they are capable of multiple insertion and extraction cycles while maintaining reliable contact over the life of the product. Various shell and contact plating options are available.